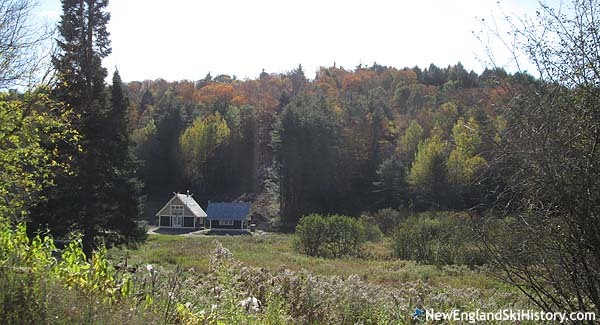 Located northwest of Rutland, High Pond operated for decades before becoming a private ski area. 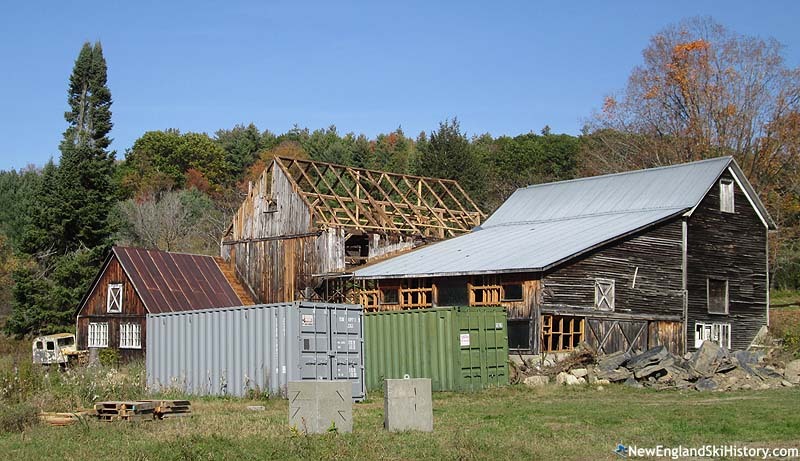 Named after the pond on the Brandon-Hubbardton town line, the origin of the High Pond development dates back to the 1930s, Cornelius Vanderbilt's great grandson William Douglas Burden began to acquire thousands of acres of land in the rural Central Vermont towns. Around this time, Burden co-founded Marine Studios (later Marineland of Florida) with Leo Tolstoy's grandson Ilya Tolstoy, Sherman Pratt, and cousin Cornelius Vanderbilt Whitney. 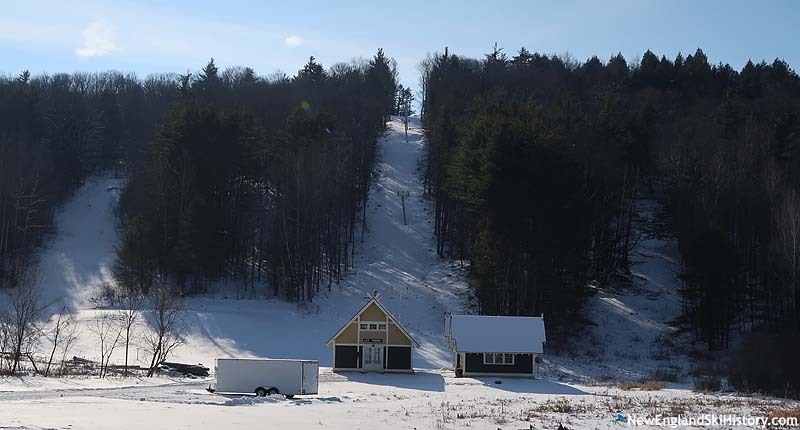 It is not known exactly when High Pond ski area was developed, however it was described in the Boston Globe as a new ski area for the 1950-51 season, sporting the state's first Platter pull lift. At the time, High Pond's 330 foot vertical drop was not significantly different than its nearby, famous competitor Pico, which was sporting a 644 vertical foot T-Bar. The name of the facility was derived by the remote body of water located to the northwest of the ski area. Lighted skating and hockey was offered on nearby Walker Pond. High Pond installed what may be the first snowmaking system in Vermont for the 1951-52 season, developed by Larchmont. While it advertised a snowmaker for the 1951-52 and 1952-53 seasons, by the mid-1950s references to it were dropped, as High Pond instead touted "good skiing with minimum snow." While High Pond initially had facilities that could put it in the upper tier of ski areas, larger resorts soon developed throughout the state, such as Killington, Mount Snow, and Sugarbush. As the 1960s arrived, High Pond was being left behind. In 1962-63, Pico expanded upward with its first chairlift, while also installing a novice T-Bar complex larger than High Pond. Likely at the same time, High Pond replaced its aging Platter lift with a new Doppelmayr T-Bar. As the 1970s progressed, High Pond faced new challenges. Following the Sunday vs. Stratton decision, High Pond's liability insurance bill reportedly increased by 600%. As a result, following the 1977-78 season, Douglas Burden closed the ski area, suggesting he would reopen if the liability issue was resolved. However, Burden never had the opportunity, as he passed away November 14, 1978 at the age of 80. According to Lost Ski Areas of Southern Vermont, High Pond reopened to the general public briefly from 1982 to 1985. Thereafter, the ski area reportedly operated on a private basis into the 1990s before gradually falling into a state of disrepair. In 2016, the area was purchased by Dartley Investments. In 2017, the ski area buildings were rebuilt and the Doppelmayr T-Bar removed. A new Leitner-Poma T-Bar was installed that year, which will reportedly operate on a private basis. "As a boy of six my family with my uncle Harold Brown of Castlton spent two days and a night at High Pond sking. I remember most fondly the deep snow outside and the log fireplace inside and the good cheer had by all. It was right out of a fairytale. Getting there in a 1949 Chevy in a snow storm up the High Pond dirt road was a slipping sliding thrill in its own. For a country boy raised on the flat lands of Maryland’s Eastern Shore, Vermont was a wonderland. My grandmother, Edith Brown of Castleton had us up every summer. Knowing how I loved Vermont. She left me a hill only a mile or so from High Pond." "don Johnson posted photos of his visit to your ski area and a little history, what a great project ! funny how small the world can be, I have and restoring the tucker sno cat from your ski area, 1949 tucker, serial number 149093 Torpedo, there is photo of the ski area with it in the background down by the lodge with a roller behind it. when I bought it, another person had started the restoration, he built a new body, fyi the original had been cut off at the back and very twisted up, he sold the new body to another person, and I bought all the original running gear, engine, transmission ID tag and related parts, I had an original torpedo body and have put everything together as one unit, I should be done with the restoration in another couple of months, I would sure like to some out with the torpedo when you get the ski area up and running, in the winter of course, good luck with the ski area regards jinn davis 503 758 3181"
"My parents took my brother sister and I there to learn to ski back in the early 70's. I can remember my older brother probably 8 years old at the time, getting the small rope tow rope caught in his clothing somehow, he ended up on his back with the skis in the air and the rope pulling him into the wheel house with the front of one ski caught in between the rope and pulley causing to drag him upside down around the pulley out the other side where he eventually fell off because the rope wasn't holding his ski against the pulley anymore. Thankfully he was unharmed,I was scared to death to see this unfold as I was right behind him to whiteness the whole thing.The memories we had there are unforgettable. I wish it was still in business today I would love to go skiing there again. Thanks for the memories! Scott P. "